Researchers have uncovered what may be the world's oldest preserved evidence of peaches in China. Peaches have been an agricultural staple in the United States for hundreds of years, but a recent study suggests that their status as a tasty snack may go back further than anyone ever imagined. According to a report from Business Standard, researchers in China have found the fossilized pits of peaches estimated to be 2.5 million years old. Archaeologists discovered eight fossilized peach endocarps, the pits in the center of the fruit in southwest China. The 2.5 million-year-old peach pits are nearly identical to the pits of peaches grown around the world today. By most historical accounts, modern humanity and their capacity for agriculture had yet to arise in the southwest region of China 2.5 million years ago. So who ate these ancient peaches and left the pits behind? Researchers think that while it may not have been early man, it was likely that some sort of primate of other animal had feasted on the sweet fruit. According to the study’s co-author, Peter Wilf, a professor of paleobotany at Penn State university, wild fruits were a key factor in human evolution. The peach may stand as an essential part of human history, serving as one of the first edible fruits to proliferate in environments where organisms ate them and dispersed their pits on fertile ground. 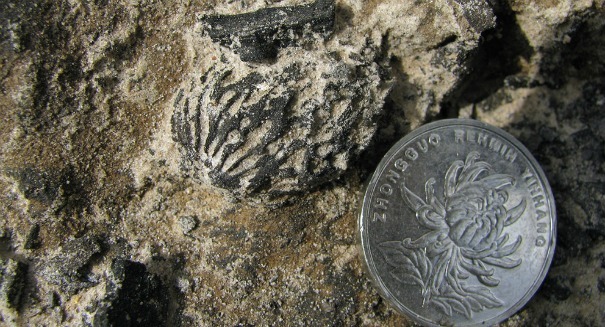 The fossils were unearthed by the study’s lead author Tao Su from Xishuangbanna Tropical Garden near Kunming in China. According to Su, the discovery offers new insight into the development of modern fruit for consumption. It also suggests that the peach may have first originated in China. A press release from Penn State University outlining the details of the study can be found here.